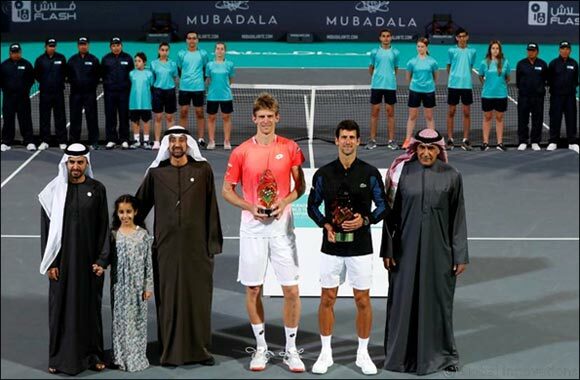 Abu Dhabi, UAE – 30 December, 2018: World number one, Novak Djokovic equalled Rafael Nadal's record of four titles at the Mubadala World Tennis Championship with a hard-fought 4-6, 7-5, 7-5 win over South African world number six, Kevin Anderson. Fans were treated to an absolute masterclass from both player's throughout the match as they exchanged powerful baseline rallies that had the crowd whooping with joy! Djokovic who was playing only his second match since the Nitto ATP Finals in London, enjoys an 8-1 career head-to-head record against his opponent and he showed his class in the match, which lasted 2 hours and 14 minutes. The Championship trophy was handed over to Djokovic by H.E. Major General Mohamad Khalfan Al Romaithi, Chairman of the General Authority of Sports. Also present were H.E. Homaid Al Shimmari, Deputy CEO and Chief Corporate and Human Capital Officer, Mubadala and H.E. Sheikh Mohamed Bin Hamad Bin Tahnoon Al Nahyan, Vice Chairman of Abu Dhabi Airports. In a rematch of the recent 2018 Wimbledon final, the Championship decider saw the opening games go on serve before the world number one put Anderson under pressure in the fourth to lead 30-40. But the South African used his powerful serve to good effect and tied the match at two games all. Anderson, who clearly enjoys playing in Abu Dhabi, put Djokovic under pressure in the ninth game and broke the Serbian’s serve as the world number one made a few uncharacteristic errors to hand the advantage to the South African. Anderson followed it up with a comfortable service game and took the opening set 6-4 in 41 minutes. The second set started off very much like the first and although Djokovic had a breakpoint in the fourth, Anderson once again used his big serves to bail him out and level the set at 2-2. The next seven games went on serve, before Djokovic raised his game and took his first breakpoint in the 11th game to win the second set 7-5. The Serbian-superstar found himself in a bit of trouble in the third game of the final set and had to dig deep to hold serve to take 2-1. A forehand winner and two aces – the first on his second serve, was enough for the world number six, Anderson to win his next service game. In the 10th game, Anderson once again found himself in trouble at 15-40 down. He saved three match points to tie the game at five games apiece. However, in the 12th game, Anderson found himself 15-40 down and this time the Serbian made no mistake as he took his second match point to seal his fourth title at Abu Dhabi. “I take a lot of positives from this match, Anderson is one of the best players in the world and has been playing with a high level of consistency. When you play someone like this at this level you want to win. It helps your confidence and adds to your mental strength. Definitely pleased to win today and looking forward to the season,” he added. Anderson who had stated before the Championship began that his primary goal was to play both Nadal and Djokovic to test his game, said: “I played really good tennis over the last few days. There are a few things here and there that I need to work on but pleased with the quality of my game throughout the tournament. I was happy with my game tonight and I can leave with a ton of positives. “I really tried to simulate match conditions as much as I could and, in the end, I didn’t create enough opportunities on his serve. Had a few in-roads in his serve game, but couldn’t afford to lose my serve games,” added the South African. Before the final, fans were treated to a special exhibition match between world number eight Dominic Thiem and Paris Masters winner Karen Khachanov, following the unfortunate withdrawal of Rafael Nadal from the third-place play-off. Thiem showed glimpses of returning to form in the opening exchanges, but the 6’6” Russian quickly stepped up the tempo and broke the world number eight’s serve to take the opening set 6-3 in 33 minutes. The contest went on serve in the second set until Thiem broke the Khachanov in the ninth game and comfortably held serve to take the set 6-4. In the super tiebreak, Khachanov raced away to a 5-1 lead aided by a couple of unforced errors from Thiem and didn’t face much resistance as he wrapped up the match in 10-3 in an hour and 24 minutes. The three-day MWTC, which is now well established as an annual season-opener, attracted thousands of fans who witnessed high-quality tennis action as the players battled it out for the winner takes all prize of US $250,000.